So, after having reviewed the documents I have pertaining to my two times great grandfather, John Hart, the publications, the census data, the land records, and the probate records, the only other pieces of evidence I have not mentioned are his headstone, which I have shared elsewhere in this blog, and the civil war record of my great grandfather, Melvin Hart, which lists his parents when he enlisted in the Civil War. I have one more roundabout way left of connecting John with his father Stephen, which would help me claim Jeremiah Hart as a Revolutionary War patiot ancestor. I believe that if I could create a link between John and one of his siblings who have a strong link to their father Stephen, then I could perhaps strengthen my case. Here is the one chain of connection through records that I have found. 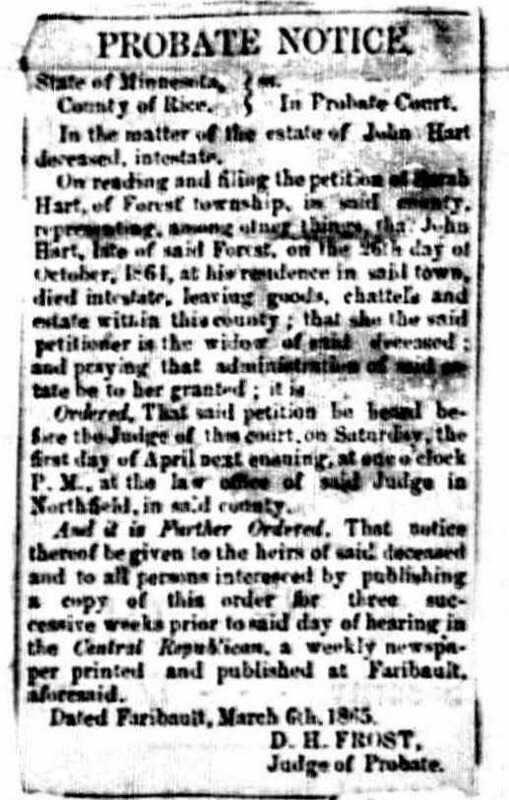 John and his children were not the only members of the Hart family who removed to Minnesota, as we have discussed. His uncle Philip Hart and his brother Stephen A. Hart went to Goodhue County. I have previously blogged about the latter. : Stephen A. Hart: The Singing Surveyor of Goodhue County, Minnesota (Since then, I have been the happy recipient of a photo of him from another descendant of Jeremiah Hart, which I share above). The one connection I found between Stephen A. and John's family is a newspaper article stating that Stephen died in home of Gilbert Samuel Chase, the husband of John's daughter Chloe (The Faribault Republican, Feburary 27, 1895). (It must be remembered that Stephen Junior was perhaps the youngest child in his family, having been born in 1818, and was therefore close in age to his niece, Chloe, who was born in 1821). This strongly suggests, but does not prove, a family connection. A brick is not a wall, but several bricks help make a wall. The Hart Genealogy explicitly states that Stephen Senior had a son Stephen Junior who lived in Red Wing, Minnesota. This is the clearest statement of the connection I have found. There are, however, other documents which connect Stephen with his siblings in New York, siblings whose obituaries and other documents clearly show that they are the sons of the elder Stephen. These are George and Alvin Hart. I plan to keep looking for other documentary evidence of John Hart's relationship with his father Stephen Hart. For example, I have yet to obtain the Civil War Pension Files for John's sons James and Joel. This is a longshot that there may be something in one of those files, and it is costly to order them. If you, gentle reader, are in possession of one of these files, and are willing to peruse them for this evidence, you would have my gratitude. I think may be worthwhile to go ahead and prepare a written case for their connection based on what I have. I will keep you informed if I am able to prove the connection between John Hart and his father to the D.A.R. 's satisfaction. It was a great day when Ancestry added millions of U.S. Probate records to their collections, as one of these records pertained to my two times great grandfather, John Hart. As you will recall, records regarding him are not easy to find, so this discovery was very welcome. He died intestate in 1864, but his probate file was rich with information, including a list of each of his living children and where they were residing at the time of the proceeding. Unfortunately, there was nothing to connect him with his father Stephen or any of his siblings. This was not to be expected, however. Sadly, I still have yet to find a probate record for Stephen, or an obituary. The only other time John appeared in a probate record that I have found was that of his wife's uncle, Stephen W. Wright, who died without having produced any children of his own. Therefore, all his living siblings, nieces, and nephews were named in his will. Although Stephen Wright's will was of little help in connecting John and his father, it turned out to be instrumental in my proving my descent from his father, Charles Wright, my Revolutionary War patriot. prove my descent from Jeremiah Hart, my patriot ancestor, so that I could join the D.A.R., I looked into land records on Family Search. This was with the help of Lil Heselton, the Registrar of my D.A.R. Chapter, who logged many hours in pursuit of such a record on my behalf. We were able to find four land transactions involving John and his wife, Sarah (a.k.a. Sally), all in the state of New York. None of them involved Stephen, however, to my disappointment. We were able to find records showing Stephen transferring lands to other of his sons, including John's brother Richard. The first record was dated March 19, 1829, in which John purchased fifty acres of land in the town of Pinckney from the estate of William Henderson for the price of $150.00. This was said to be a portion of Lot 32. (There is also a record dated six days later showing his brother Richard purchasing land from his father Stephen). John then sells fifty acres of land in Pinckney on April 18, 1844, fifteen years later, for the sum of $500.00. He is living in the town of Rodman at the time, which is about ten miles away from Pinckney. Subsequently, on September 26, 1844, he buys fifty acres of land in Hermon, St. Lawrence county for $378.00 The 1850 U.S. Census shows him living in Hermon, .with the value of his real estate being $500.00. On October 19, 1858 he sells his land for $1000.00, more than doubling his initial investment. Another land transaction could not be found, but on the 1860 Census he is back living in Pinckney with the value of his real estate being $250.00, and his personal estate being $951.00. Of course, by 1864, the year of his death, he has relocated to Rice County, Minnesota. I have not been able to find any evidence of John having purchased land or homesteaded in Minnesota. As his wife appears in the Minnesota Censuses living with their children, first with son Joel, and then with daughter Delilah, he may also have been living with Joel during his time there. As promised, let's explore together John Hart's appearances in the U.S. Censuses. Fortunately, he appears in every possible U.S. Census from 1800 to 1860. Unfortunately, in the one New York State Census, that of 1855, he cannot be found because the census pages from the area of St. Lawrence county were he was living at the time are not available. John first appears in the 1800 Census, not as a name but as a number, since the first U.S. Censuses only named the head of household and just counted the rest according to age group and gender. We find him in the household of his father, Stephen Hart, in Stillwater, Saratoga County, New York. As John was born in 1797, he would have been about three years old at the time, and is included as one of two males under the age of ten, the other presumably being his brother Richard, who would have been about one year old. Similarly, in 1810, after Stephen has taken the family to Lewis County, New York, John would be one of the boys who are in the household aged 10 to 15. Again he shows up in Stephen's household in 1820 now as one of the two males who are from 16 to 25. By 1830, John is the head of his own household in Pinckney, New York, as he has married Sally (Sarah) Wright Merriam in 1820, and started his family. He is the one male between 20 and 29 despite being about 33 years old. His wife is listed as also being between 20 and 29, despite being about 34 years old. (This is odd). Four of his five daughters born by 1830 listed in the family Bible page from Melvin Hart's Civil War pension file are accounted for (two females under five, likely Alvira and Delilah, and two females from five to nine, likely Chloe and Lovina). The other daughter, Aldula, born in 1823, and thought to have died as a child, is likely the one not listed, as all of the other daughters lived to adulthood. There is an additional male between the ages of 10 and 14, who may have been a nephew of the couple, or one of John's youngest three brothers. The 1840 Census shows John still living in Pinckney, and all the children thought to be living at that time are accounted for, as his wife, in the numbers. The only anomaly is that there is a daughter listed as being between five and nine, and it seems that this is meant to be Delilah, despite her being about eleven at the time. This time, both John and Sarah are in the correct age ranges (40 to 49). By the time of 1850 Census, which is the first U.S. Census in which all of the household members are named, John and his family are now living in the town of Hermon in St. Lawrence County. John is a 53 year old farmer born in New York, and his wife is 53 and born in Connecticut. Four of their children are living with them: James 16 (a laborer), Phebe 14, Hester Ann 11, and Melvin 7. All four children have attended school in the past year, and all were born in New York. In the 1860 Census, the last in which John appears, he is back living in Pinckney, New York with his wife “Sarah” and his youngest daughter, “Hester A. Main”. Hester has married Samuel Main within the previous year, and is a 21 year old “domestic”, born in New York. John is a 63 year old farmer, also born in New York. The value of his “real estate” is $250.00, and his “personal estate” is valued at $931.00. His wife is a “housewife” born in Connecticut. Although John dies in 1864 in Minnesota, his wife Sarah appears twice more in censuses. First, she appears in the 1865 Minnesota State Census, where she is living in Forest, Rice County, Minnesota, with her son, Melvin, in the household of her son, Joel, who is married and has two children. Finally, she appears in the 1870 U.S. Census living in Walcott, Rice County, Minnesota, with her daughter Delilah Glazier and her family. Sarah is a 74-year-old “retired housekeeper” born in Connecticut. So that it is clear that I am not mistaking my John Hart with another John Hart who also lived in Lewis County, I checked through the Census data on Ancestry, and found a few others who lived in Lewis County from 1840 to 1915. None of them could be mistaken for my John as their birthdates ranged from 1823 to 1847. One thing I have not shared with you yet is that I was successful in becoming a member of the Daughters of the American Revolution a few years back. My hope was to prove my descent from Jeremiah Hart of Stillwater, Saratoga, New York, as we share the same last name, but could not. This was because I could not prove to the D.A.R. 's satisfaction that my two times great grandfather John Hart was the son of Stephen Hart, the son of Jeremiah. Instead, I was allowed to switch patriots, and then easily proved my descent from Charles Wright, one of my favourite ancestors. Nevertheless, I am determined to prove my descent from Jeremiah as a “supplemental” patriot ancestor, particularly as he is a proven Mayflower descendant, and I may some day want to join the Mayflower Society. Also, I like a challenge. I thought I might use my blog as a way to examine the evidence, and perhaps find more in the process. I am aware that some of my distant cousins out there are also trying to prove their descent from Jeremiah for similar reasons. The cousins I have heard from are often also “stuck” in proving the link in one generation. I hope that by sharing my process I may also help them. In this post, I will look at the books and articles in which John has appeared. These include four genealogies, and one article in an anthology. In future posts, I hope to look at John as he appeared in the U.S. Census, land records, probate records, a family Bible, records pertaining to his children, and his tombstone. I will also look at how the records involving other family members, including newspapers, may help. (Please refer to my previous blogposts on John Hart for additional information about him). DNA on Ancestry is already pointing the way as my siblings and I are matching with other putative descendants of Stephen Hart, (and of John and Jeremiah for that matter), but as yet this type of documentation is not accepted by the D.A.R. To utilize DNA, I would have to prepare a proof using the Y DNA of my brother, and that of a proven descendant of Stephen or Jeremiah. (Note: if you are out there and are willing to participate, please let me know. You would need to be a male descendant on a purely paternal line, and would likely also share the surname Hart). In Genealogical History of Samuel Hartt from London, England, to Lynn, Mass., 1640 and Descendants, to 1903 in the section on Stephen Hart, John is listed as a child of his, and all that is said about him is that he was “a farmer in New York”. I remember being quite excited about my discovery of this book, as it was the first and only document I have ever found linking Jeremiah to Stephen and also to John. I thought that this was my “smoking gun”. John is also mentioned in the Merriam Genealogy in England and America as being the spouse of Sally Wright Merriam, “b. Aug. 12, 1796”, and that they removed to “Minnesota”. In addition, I gratefully received an article from the Lewis County Historical Society, entitled Pinckney Corners—Its Settlement, Settlers, Where They Made Their Homes—Recollections by L.F. Wright. It was stated to be originally from the “May 1890, issue of the Copenhagen Visitor”. The article was published in the book, Copenhagen, New York: An American Bicentennial History. There is quite a bit about Stephen Hart in the article, including a list of his children. John is the first mentioned. John is also mentioned in The Kelloggs in the Old World and the New, as the father of Hester Ann Hart, who married Austin Jabez Kellogg. According to the author, John was on May 11, 1797, and his wife, "Sarah Merriam", was born August 12, 1796. Both John and Sarah are said to have resided in "Faribault". Finally, I was fortunate enough to find another more recent genealogy via Family Search, William and Isabella Masson Campbell of Hastings County, Ontario, their ancestors and descendants, which includes a section on my great grandfather, Melvin Hart, and which includes mention of his father John. It appears that their source was a likely a Hart family member most likely from the Kells family. (Note: if you or someone close to you was the source, I would love to hear from you). It states, “John Hart was born in Stillwater, N.Y., 11 May 1797. He married, 3 Nov. 1820, Sarah Marriam, b. 12 Aug. 1796”. It then goes on to list their children, a list which is identical to the one quoted in Melvin's Civil War Pension File, whose origin is stated to be a family Bible created by copying one in the possession of one of his sisters. I am thinking that the other information given in Masson Campbell book, particularly the marriage date, which I could find nowhere else, may also have come from a family Bible, possibly Melvin's own. If you own this Bible, or a similar one, and are willing to share the pertinent pages with me, you will make my year. 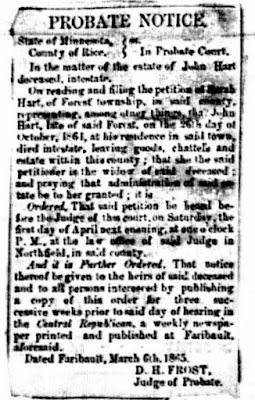 Many genealogical researchers, including me, have struggled in vain to find the parents of Abigail Pearsall, the wife of Jeremiah Hart. However, I think I may have come closer to a solution using family trees and DNA. We have a limited amount of information about Abigail, most of which comes from county histories, lineage books, and her tombstone. 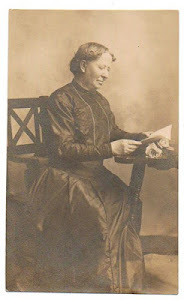 From the latter we know that she died on February 3, 1848 in her “77th year”, which places her birth date at about 1748. We do not know for sure where she and Jeremiah were married, or where she was born. Therefore, I decided to look at the Pearsall families in Dutchess county, New York, where Jeremiah lived after leaving Rhode Island, and the Pearsalls in Saratoga county, New York, where we know they lived as a married couple. I created separate trees on Ancestry for the Pearsalls of Dutchess county, and the Pearsalls I found in Saratoga county. In the process, I found that some of the same families had lived in both counties. After having my DNA tested through Ancestry, I identified people who matched with me who also had the name Pearsall in their lineages. I felt that this was a reasonable avenue of research since I was also matching with people on Ancestry whose more recent common ancestor with me was Jeremiah himself, as well as some of the three Richard Harts who preceded him. I therefore thought that it would follow that I might have some matches showing up who descended from Abigail's forebears. I then created a “Pearsall DNA” tree based on the trees of my “Pearsall” matches. There were several, and they keep showing up to this day. Most of them show descent from the couple, Nathaniel Pearsall and Sarah Todd, some of whose children also resided in Saratoga County at the time Jeremiah and Abigail were living there. These are Sarah, (m. Samuel Sering), and George, both of whom resided in Greenfield, twenty miles away from the Hart homestead in Stillwater. There are books which name the children of Nathaniel and Sarah, but none of them mention Abigail. However, I have often seen such pedigrees which omit some of the children, very often female. Looking at the birth dates of the Pearsall children, Abigail could easily have been born between Hannah (b. 1743), and Mary (b. 1749). In any case, I have yet to find any document linking Abigail and her immediate family to her purported siblings, but I continue to look, particularly in newspapers. I have decided to consider this DNA evidence as being strong, and have taken the liberty of assigning Nathaniel Pearsall and Sarah Todd to Abigail as her parents on my main tree on Ancestry, “A Hart Family Tree”. If you are one of Abigail and Jeremiah's descendants, and you also have a tree on Ancestry and DNA matches, I invite you to repeat my experiment. I would be very interested in hearing about your results. Theodorus Hart from Simon Lobdell--1746 of Milford Conn.
With so much family history being available on line, we may tend to forget that previous generations had a much greater challenge piecing together their family trees, despite their being closer in time to our ancestors. Access to records was much more difficult for them, and it is likely that they relied more extensively on family stories. Because of this, it pays to be wary of what they had to say about their forebears. A case in point is that of Theodorus Hart, (a.k.a. Theodore), the publisher of the Pittston Gazette in Pennsylvania. He lived in the latter part of the nineteenth century, and is responsible for many a wild goose chase on behalf of our mutual ancestor, and Revolutionary War patriot, Jeremiah Hart. I believe it is important to help set the record straight about Theodorus's mistaken notions about Jeremiah's origins. which both deal with Jeremiah Hart and his descendants. This is because both works, in their discussions of Jeremiah's descendants, focus on Theodorus. O'Hart writes, "There is yet another branch of the 'Hart' family located in Pittston, Pennsylvania, which we cannot connect with any of the foregoing families, but which, judging by its coat of arms, is, in our opinion, a branch of our own family. We can trace the descent of that branch only from Jeremiah Hart, who when a young man lived in Duchess County, State of New York; removed to Saratoga County in said state, there married, owned a large farm, and lived and died". There follows a description of the lineage ending with Theodorus. In addition, Theodorus's obituary in his own newspaper enlarges upon the same story. He appears to believe that Jeremiah and his brothers came from Ireland, which we now know is not the case. The records show that Jeremiah was born in Little Compton, Rhode Island, and was descended from a line of Harts, with the first Hart in America being Nicholas, the merchant of Taunton. It is however, possible, that Nicholas, who very much appears to have been born in England, may have been of Irish descent at some point. Theodorus, born September 10, 1847 in Athens, Pennsylvania, was descended from Jeremiah Hart's son Philip, who lived in New York, Pennsylvania, and Minnesota. Theodorus died of “muscular rheumatism” on April 13, 1901. His obituary in the Pittston Gazette, dated the day of his passing, (and may therefore have been partially written by Theodorus himself), states: "The blood of sturdy, patriotic Irish stock flowed in his veins. Three brothers of the O'Harts (as the family name was originally written) immigrated from the region of Dublin to America close to half a century previous to the outbreak of the Revolution. One of the brothers finally settled in the vicinity of Saratoga, N.Y. It was from this branch of the family that the subject of our sketch was descended, and it is a sufficient explanation of his patriotic instincts to say that his great grandfather on both sides fought in the War of the Revolution, and that his grandfather, again on both sides, served against the Mother Country in the War of 1812". Theodorus also seems to be the source of possible misinformation about Jeremiah Hart's wife, Abigail Pearsall. Both of the O'Hart books state that Jeremiah married “Abigail Purcell (nee Macomber)". However, O'Hart makes a correction in the Irish Landed Gentry book, "At p. 86, No. 1 read: 1. 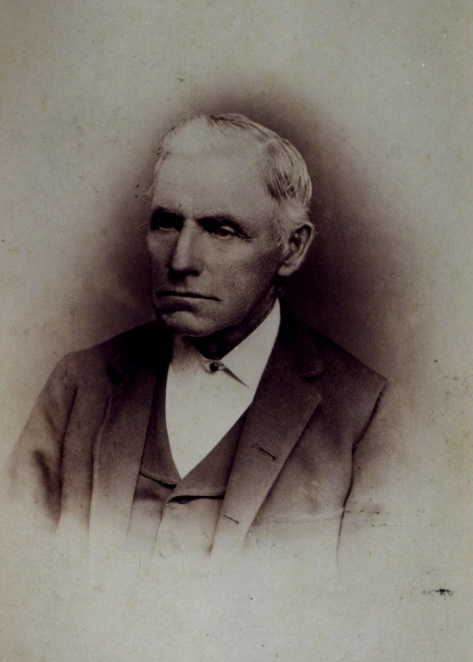 Jeremiah Hart, of Saratoga County, state of New York, b. circa 1850; married Abigail (Macomber) Purcell instead of Abigail Purcell nee Macomber". I have yet to find any sign of the name “Macomber” being associated with Abigail anywhere else. However, Jeremiah's sisters Hannah and Susannah both married Macombers, and so there may be a connection between Abigail and the Macombers of which we are not yet aware. I hope to write more about Abigail's more likely parentage in a future blogpost.